Inspecting components in a manufacturing environment is a process that takes time. Where processes take time, it’s possible to make efficiency savings. Importantly, however, you can’t just calculate the time it takes recording the actual measurements. Everything is important, from getting components from the production line to the metrology inspection point, to mounting components ready for inspection, to adjusting the orientation to take new measurements, to removing the component ready for the next. Finding efficiency savings in this overall process is, therefore, essential. There are many ways you can do this, from the layout of your production facility to the metrology inspection procedures you put in place. One of the most effective options available, however, is using multi-component fixtures. Multi-component fixture solutions let you mount and inspect up to 196 components at a time – whatever is required to match your mould cavitation layout. Multi-component fixtures won’t be suitable for all applications, but where they are suitable, efficiency savings can be significant. Of course, whatever fixture design you use, accuracy and reproducibility are non-negotiable features. This has always got to be the main focus when designing, manufacturing, and qualifying metrology fixtures, particularly those intended for use in the MedTech sector. That said, substantial efficiency savings in the overall metrology inspection process are possible. The key is innovative fixture design. As already mentioned, the potential efficiency savings that are possible in the actual inspection process are minimal, i.e. at the point where the component you are measuring is mounted on the fixture and you’re taking measurements. Therefore, you need to look at other stages of the process to find where you can make efficiency savings. This includes the time it takes to change the orientation or inspection point of the component, and/or the time it takes to adjust the component in the fixture ready for the next set of measurements. With a multi-component fixture, you can load multiple components, take measurements at the first orientation, and then change the orientation of all the components at once. This is considerably faster than mounting and measuring at every orientation each component one-at-a-time. At Verus Metrology, we’re taking the concept of multi-component metrology fixture design and manufacture a stage further by adding automation technology to metrology fixtures. This type of fixture solution is suitable for components that need to be adjusted within the fixture to move to the next stage of the inspection. 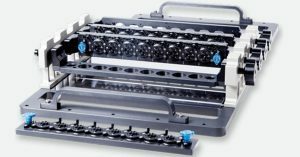 While a traditional multi-component fixture will deliver efficiency savings when compared to measuring components individually, manually adjusting components in the fixture is a time-consuming process. Automating component adjustments is a gamechanger in relation to reducing the time it takes to complete the inspection of components. Of course, adding automation adds complexity to the solution. However, this must be seen in the context of the ongoing drive for efficiency savings in the MedTech industry. Using multi-component metrology fixtures is a quick win. Following on from that, automating parts of the inspection process using an advanced fixture design is the next step in the evolution of metrology fixture design.